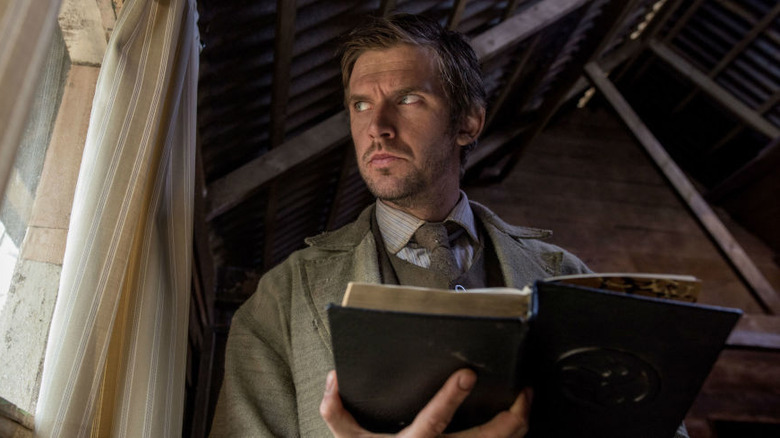 Apostle, the new Netflix horror film from director Gareth Evans (The Raid), is a delight for fans of horror folk tales and period thrillers alike. 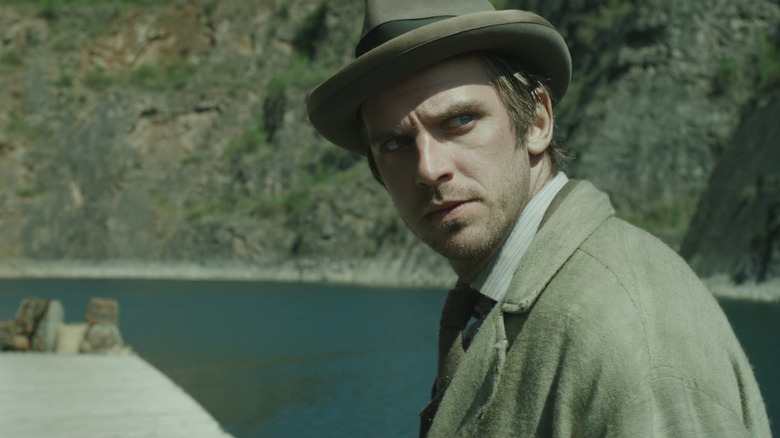 Set in 1905, the film follows an apparently damaged man named Thomas (Dan Stevens) to a mysterious island, where his sister is being held ransom by the leader of a cult (Michael Sheen) that's sprung up and continued to draw converts from the mainland. Once there, what begins as a search for his sister quickly turns into something darker, as Thomas discovers the cult is more than just a group of followers tied to one charismatic leader, but instead a system to sustain something much larger. It's scary, it's unpredictable, and it's driven by terrific performances from Stevens, Sheen, and their castmates. It's also packed with little details and implications that you'll be chewing on long after the credits have rolled. 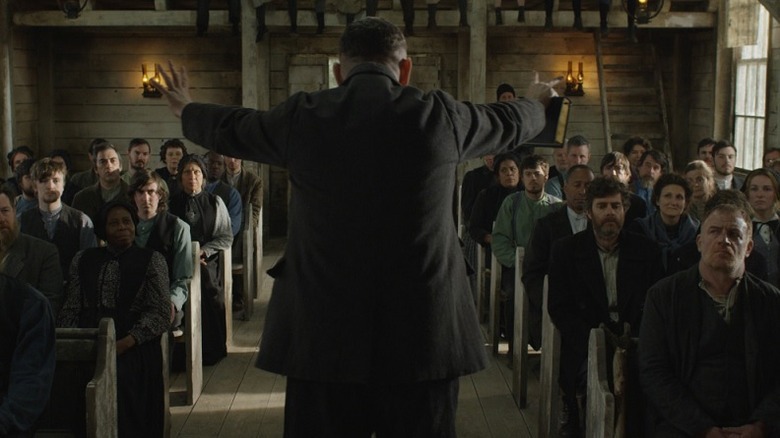 Now that we've experienced all this Netflix hit has to offer, we're tackling the thrilling finale of Apostle, unpacking what it all means, and what it could spell for the future of the world of the film. Oh, and it should go without saying, but there are SPOILERS AHEADm. One of Apostle's great strengths is the sense that there is a detailed and fascinating mythology lurking throughout the landscape, but the film never goes out of its way to hand-feed the audience every piece of it. It unfolds slowly, giving us a little piece here, a bigger chunk there, until we get an expansive but still somewhat murky picture. By the end of the film we understand how Malcolm's cult works, what it needs to survive, and what Her (Sharon Morgan) is and does, but there's still so much left unexplained. How, for example, did the power structure ultimately shake out, with Quinn (Mark Lewis Jones) acting as the real power player while Malcolm became the figurehead? How did they decide on the various rituals, including the brutal "purification" ceremony, and how and when they'd be carried out? And, perhaps most importantly, who and what is the Grinder (Sebastian McCheyne) and how did he come to be? With a new god in residence on the island, could all of these things be restored? Are they all doomed to repeat anyway because of humanity's depravity? These are questions we must ask even if we don't want to imagine the society of Erisden reorganizing in such a way. By the end of the film, everything about the island society of Erisden is falling apart, to the point that the island literally belches sacrificial blood out of a cliffside, rejecting what humanity has built there. 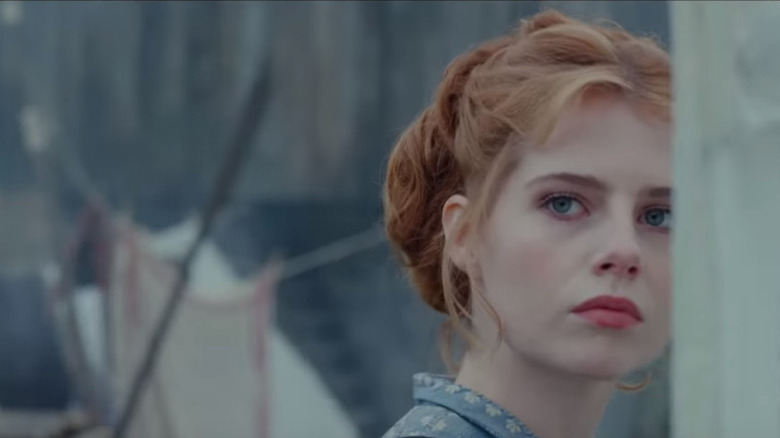 Luckily for the residents, many in the settlement manage to make it to the ship that will take them back to the mainland, including Malcolm's daughter Andrea (Lucy Boynton) and Thomas' kidnapped sister Jennifer (Elen Rhys). Sadly, they're both going back to a world that has either forgotten them or come to believe they're parts of a mad religious organization that's not only on the fringe, but a threat to the British crown. Plus, Andrea has now lost her father and some of her friends, and Jennifer has lost her brother. One way or another, they're going to have to at least attempt to explain some of this to the authorities, and then go on about their lives. Neither of them seems to have committed any real crime, so that's good news, but they're likely heading back to a world that will make media sensations of them, treat them as outcasts (particularly Andrea), or both. It won't be an easy transition. 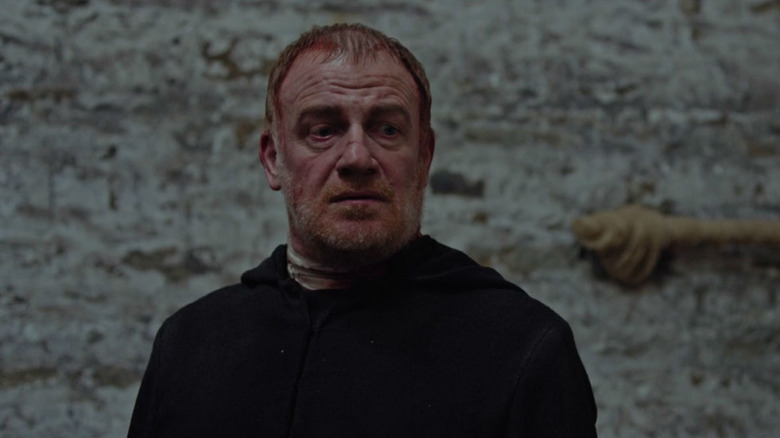 It's made clear very early on during Apostle that the settlement on Erisden has an impressive degree of influence, and not just because spies and assassins from the Crown have become a real concern for them. When Thomas arrives on the island, he does so with several other new converts, one of whom mentions "prayer meetings" she'd been attending before making the commitment to journey to Erisden. While we don't get too much more detail, this suggests significant pockets of influence and power for the group on the mainland, which also suggests some devoted followers who may not simply give up their belief system because they learn that the settlement burned. Sure, many will see it as a sign that Malcolm's movement couldn't sustain itself, but others might believe that they can do a better job of taking up Prophet Malcolm's teachings and carrying them on. Whether Malcolm has ended his time as a leader or not, we may not have seen the last of the cult of Erisden. When we first meet Malcolm, he's presented as a steadfast prophet with absolute faith in the island, its goddess, and its gifts. He's the man who the island chose to speak through, who wrote the sacred text upon which the Erisden society is founded, and who seems to have total control over the settlement. By the end of the film, though, it's revealed that Malcolm's beliefs are not necessarily the cornerstone of the society, and that Quinn's own desire for power is what really drove Erisden's foundation. Malcolm is a man who discovered a supernatural force and developed a faith in it that he could not control, and it ultimately destroyed everything he built because he didn't have the ruthlessness to follow the path Quinn had laid out. Now, with a new god born in Thomas' body on the island and a chance to thrive again, what does he do? Can he possibly restore his faith in the island what it offers, will he become more ruthless now that he's lost everything all over again, or will he finally develop the loving relationship with his nature god that he always desired in the first place? It's hard to tell, but the smile on Thomas' face at the end suggests there's a chance at something more hopeful. Thomas also goes on a journey of challenged faith. He arrives at the island seemingly believing in nothing but getting his sister back, and then reveals to Andrea that he was once a missionary who held fast to his belief in Jesus Christ until he was tortured in Peking. His faith broken, he returned home, finding only pain in what was once a steadfast belief in a loving and just God. By the end of the film, Thomas has seen and felt things he seemingly no longer believed possible. He's met a god, killed a god, and been reborn a god himself. 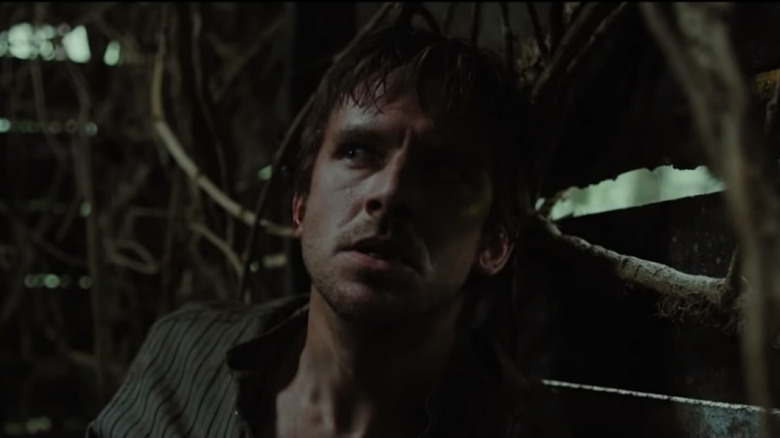 To the extent that he still has human emotions and thoughts, what does this mean for his faith, or what did it mean before the magic of the island began to grow in him? Does he believe that an almighty god created this place and these abilities? Does he see himself as a conduit? Or, perhaps more importantly, does he now simply believe that there are mysterious powers in the world beyond his previous conception of God, and that he's now the avatar of one such power? The film doesn't answer this question, but his smile suggests a measure of peace and wonder. Though she's often referred to as a goddess throughout the film, Quinn insists that the creature they've trapped is not a god, but rather "a machine" that produces "results" when fed blood sacrifices. Whatever she is or isn't, she clearly has abilities beyond previous human understanding (this generation of humans, anyway), and by the end of the film that power has transferred over to Thomas. 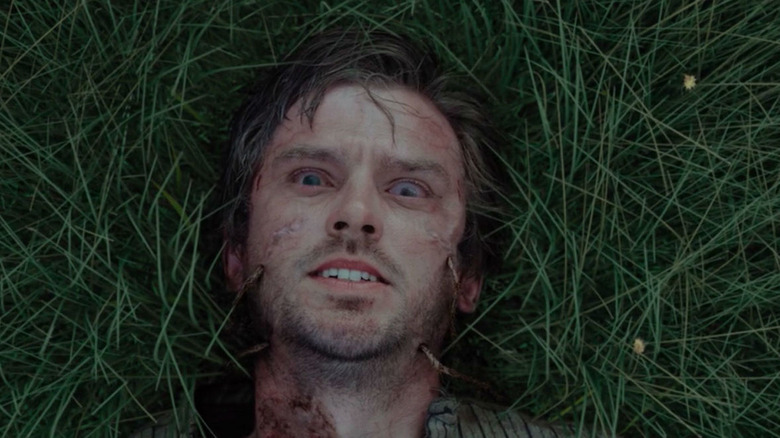 Thomas seemingly gets the god powers of the island because he was willing to offer himself as a sacrifice, freeing Her and saving Andrea and Jennifer in the process while also ridding the island of Quinn's evil. To that end, he has apparently been rewarded with the powers of a nature deity, but what we don't know is how deep those powers reach. Things are clearly growing around him, but how much can he influence the world? How much control does he actually exert over the landscape, and is it merely contained to the island? Does he have the same memory projection powers the goddess had, and can he tap into her own memories of the island? If we'd stayed with the story for maybe half an hour more, we might have more concrete answers. A god at what cost? The final moments of the film clearly show us Thomas' transformation, but all we see is the beginning. As we've already discussed, we don't get to see what a newly born god does or how he behaves, or how deep his powers go. What we also don't see, though, is what it will take for him to survive in his newborn state. The film never shows us exactly how Quinn and Malcolm captured Her, but we do know that they used blood sacrifices as a means to feed the island's fertility, and that eventually animal sacrifice was no longer enough. We can also infer from the first meeting with the goddess that she'd been a part of the island in some form for some time, and that she seemed to initially crave devotion. What will Thomas crave? Does he require blood sacrifice? Worshippers? Does he need a congregation and a prophet, or will he be content to live in peace with the land for a while? We simply don't know, but that smile we see could mean much more than contentment. It could also mean a thirst for manipulation. 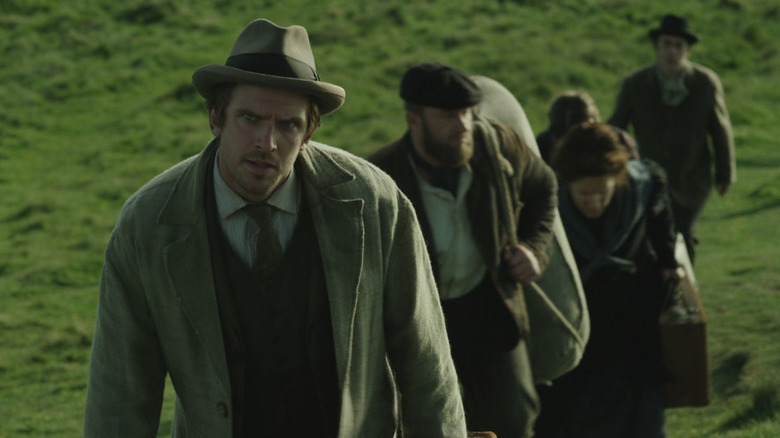 Apostle depicts an isolated, seemingly very contained story of a group of people who just happen to stumble upon some kind of ancient nature deity, and how their attempted manipulation of those forces eventually leads to self destruction. The world building is precise, evocative, and creepy, but it also all happens firmly on Erisden. Still, the way it all plays out, with the sense that the founders of the settlement just happened to stumble on a deity, begs the question: Are there other goddesses and gods waiting out there on other islands, longing for the attention of worshippers and sacrifices? 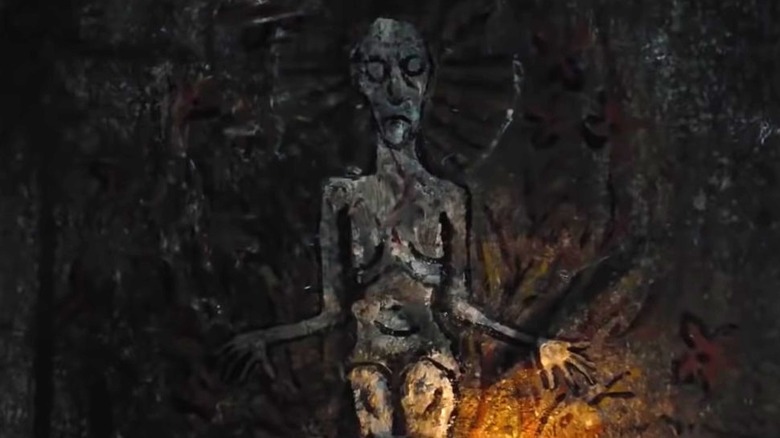 Are there deities in the depths of the oceans, in the darkest parts of the forests? Are the ancient spirits of the world of Apostle still out there, waiting for another Malcolm or another Thomas to bring them to the light? If this truly is the modern world awakening to the wonders of the ancient, what will happen next? Will the old gods come out of hiding? 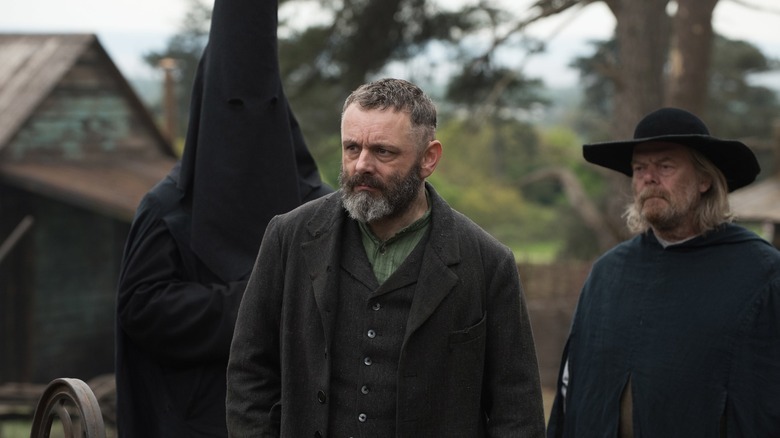 We have no way of knowing how powerful Thomas is now or if there are others like him, but the world of Apostle does set up one very clear implication about what comes next in this story. Throughout the film we are told that spies from the mainland have been keeping a close watch on Malcolm's settlement, and the government is coming ever closer to sending ships and soldiers to simply shut Erisden down. Malcolm and Quinn both fear this deeply, and now Erisden settlers are heading back to the mainland with news that the town is burning and people are dying. A government that's already had its eye on the settlement would have no choice but to take this as an invitation to go out and investigate the carnage themselves. That might not definitely lead them to Thomas and Malcolm, but if they look hard enough they'll encounter a god, and then the battle between the corruption and man and the purity of nature could reach a new level. The struggles of Apostle are very clear metaphors, but we've only scratched the surface. Here's hoping Netflix brings us back to Erisden someday.